Rose Noire was the first of 2 bands slotted for the Saturday night concert, a promise of very good things to come. Having the arguably daunting task of being the opening act, Louie and Jill showed us what this sibling duo is truly made of. Present for opening ceremonies, Louie strode a top the stage with the utmost confidence, Jill right behind with an elegance I wish I had. Confidence is a word you may see a lot from me in this report, as Louie truly portrayed this thoroughly. Engaging the crowd and not settling for a poor response, Rose Noire made their mark on Anime North. As the intro music played, the crowd started their cheers, a few chaotic rounds of clapping rhythms and the band made their entrance. Jill came out first, the fans shouts increased and anticipation grew. Louie entered the stage and the level rose even further bringing an almost smug look to his face. As the intro changed into the support track for their first song, their demeanor changed from that of basking, to intensity. 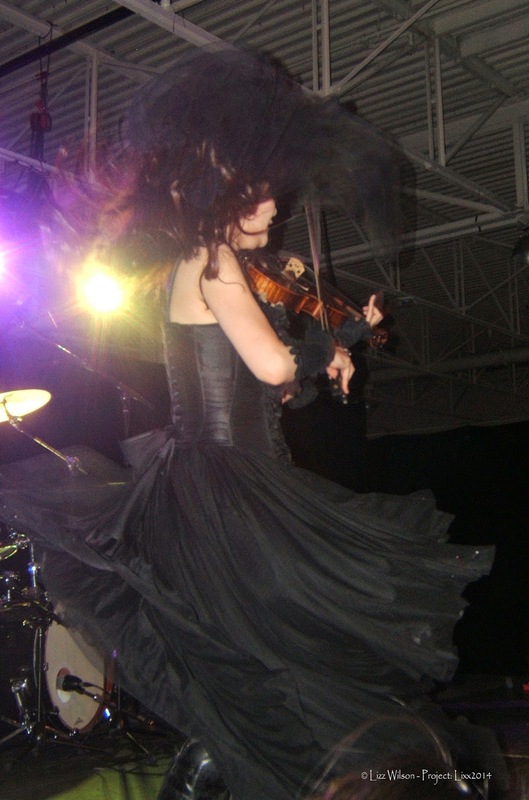 The skill of Rose Noire was evident as both siblings took to their violins as though they were merely extensions of themselves. We were taken through a maze of elaborate and engaging songs that would lift you into a frenzy before soothing your melancholy thoughts. Louie is a crowd flirt. I mean, bands flirt with crowds all the time, but Louie is right down, eye to eye and you could literally hear every girl he gazed upon swoon and squeal with delight. And though I have never been a huge fan of his recorded vocals, in person they take on an ethereal quality that combined with his persona, make him every bit the fantasy vampire you hope will swoop down in the night and take you away. Not to be outdone by her charming brother, Jill dances across the stage engulfed by melody, also setting her eyes upon the group. She floats from one end of the stage to the other seemingly lost in her music, yet completely connected to everyone around her. During the set Louie spoke to the crowd while looking for the next background track to play. Commenting, ‘no, not this one’ then gesturing towards Jill he states ‘play something’. And after a little back and forth banter Jill plays through a few game tunes, the crowd’s reaction immediate at hearing some of their favorites. As the set drew to a close, Rose Noire drove the energy up even further, playing a very lively number. Even though we thought we might not have much energy left in us, we quickly found that we did. As the band said their good-byes, cheers rose up from the crowd, a feeling not enough mutual among the fans. Chants began, and even though not common for the first band on stage, we were treated to an encore! Energy ramped ever higher as Jill and Louie proved that they still had plenty left to give and the crowd gave everything they had. After the concert, fans eagerly lined up for an autograph session, buying what was left of the bands merchandise for chance to bring home even more memories of an enchanting evening. Sunday, just after lunch we were treated to one more appearance by the band at the fan Q&A session. 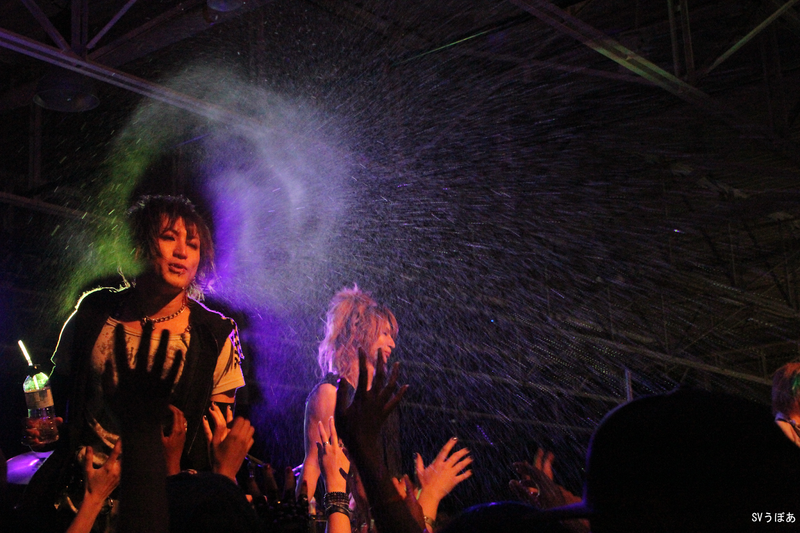 In conjunction with DaizyStripper, fans had the chance to ask the bands whatever they had on their minds. Some laughs and a few stories later, we head to the last autograph session where fans had the opportunity to thank the bands one last time before their return to Japan. 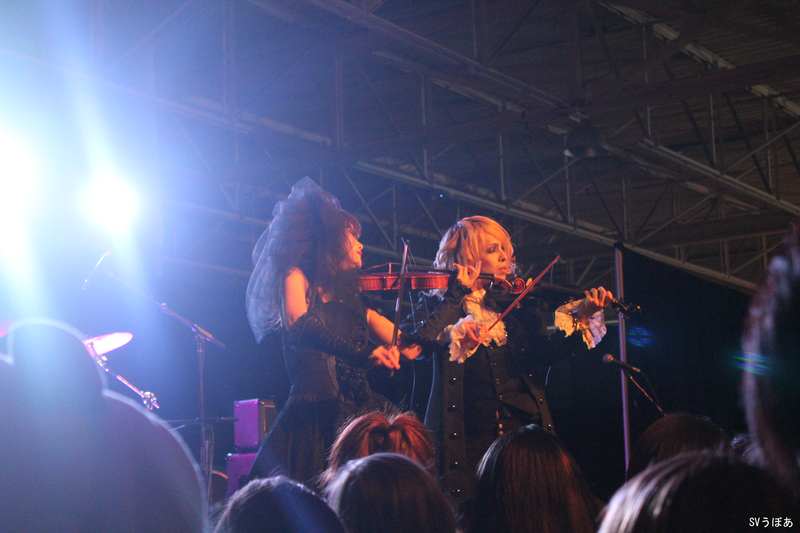 After 2 successful shows, first at Otafest, then here at Anime North I am certain we will see them here again! Thank you to J-rock North Promotions, Darkest Labyrinth and of course Rose Noire for a fantastic weekend! 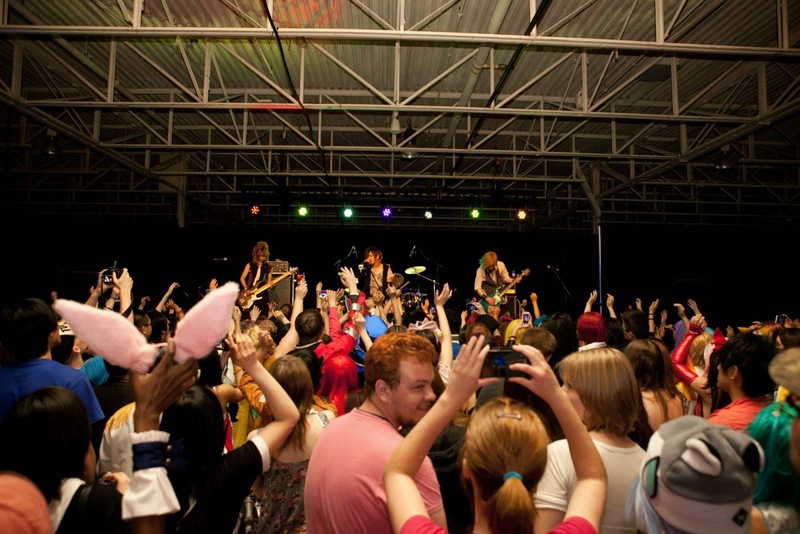 On June 6, A-KON, North America’s longest running convention, played host to two amazing bands, GEEKS and Ra:IN, and brought them together in a cataclysmic clash of musical wonder. I hadn’t heard of GEEKS, but I had definitely heard of Ra:IN and am myself a huge fan of Pata’s work. It was something I had to see and hear for myself. Fueled by the urgency to attend, I made my preparations with less than a month before the convention. Having arrived late back on-site from a rest-stop at a friend’s hotel room, I thought I had missed GEEKS’s part of the show. Not terribly heartbroken, I walked into the ballroom, expecting set-up for Ra:IN to be taking place, but to my surprise GEEKS was just beginning, and I was glad to have not missed it. They were extremely energetic and loud and kept the crowd going crazy through every minute. 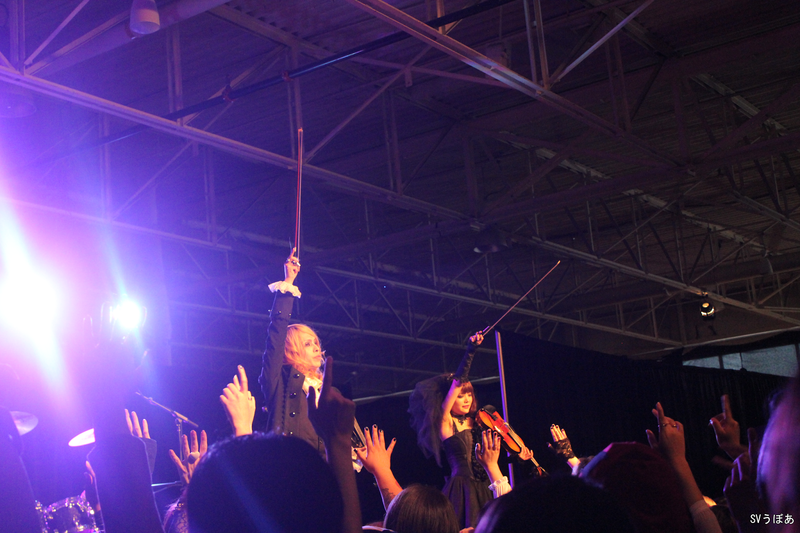 The crowd roared and jumped around wildly and signed hearts which the band gleefully returned. They left the stage asking their fans to promise to come and see them in Japan someday, and they were sent off with a chaotic sounding of fanatic cheering. Even though I had to save what energy I had left for Ra:IN, I found myself cheering and signing a heart to GEEKS as they left the stage. There was a short intermission to give the roadies time to set everything up, and the intro for Ra:IN began. 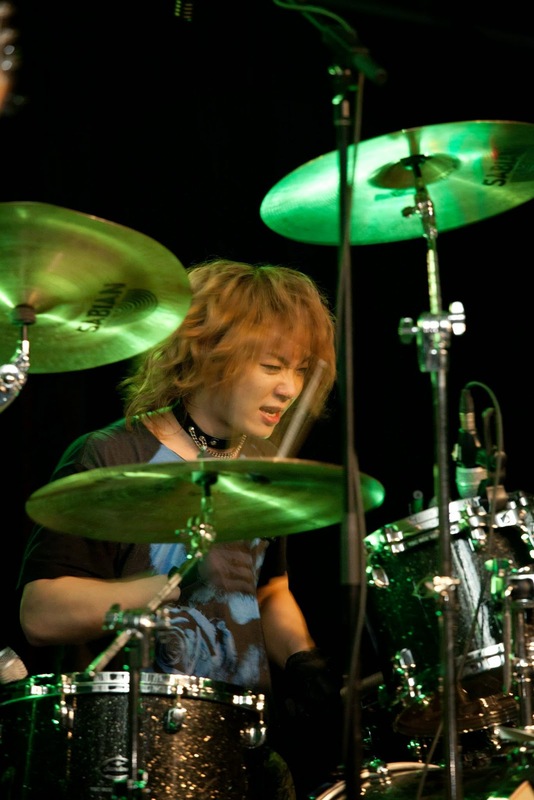 First out on the stage was support drummer Ryuichi Nishida, followed by Daijiro “D.I.E.” Nozawa on keyboard and Michiaki Suzuki on bass. Lastly, Pata came onto the stage and the band started to play. The response was immediate, like some sort of switch had been flicked on. Horns were up in the air, keeping time with the music, and hair and wigs were flying. The energy in the ballroom was a lot stronger than it had been for the previous band and everyone, even the viewers who had no idea what was happening, got caught up in the action. Not too long after the first song was ending, they had already began the next, D.I.E. picking up his mobile keyboard so he could move around the stage and Michiaki and Pata battling bass and guitar. Exhausted from the drive and long day, my movements were little more than a little bit of head nodding. That is until Michiaki took it upon himself to point me out and motion me to start putting a little more energy into it. The rest of the concert became a blur of cheers and headbanging. The lights came up, after what seemed like hours later, and immediately the room was filled with chants for an encore, which the band gave with even more energy than before. At the end of the night were the autographs session, and having gotten an agreement with the Babel Entertainment management crew and the band due to my morning departure, I got to take my photo-op that night. That was an adventure in and of itself. I was already flustered because coming through for autographs I managed to drop everything at least once, getting a round of laughs from D.I.E. and Ryuichi. I clammed up and couldn’t move, causing Pata and D.I.E. to come forward and pull me to the middle of the group. They were all extremely nice asking if I was doing okay and giving me the most sincere smiles, even though we all knew we were wiped out and not ready for this in the least. Pata looked over the photos taken with me and asked if each shot was okay, and Michiaki even called me back over to take a few more photos, just to make sure we got good shots. We shook hands and said our thanks to each other and the night was perfect. 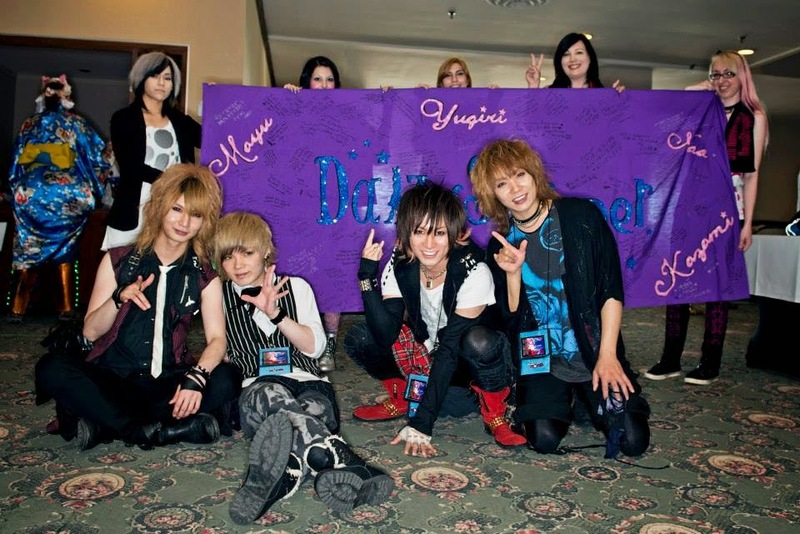 No matter how much I write in this report, nothing will convey truly my excitement of seeing DaizyStripper live for the second time here in Canada. This band has my heart. Fans had their first opportunity to see the band at opening ceremonies Friday afternoon. Sadly I don’t think too many fans were there. I was caught between wanting to scream, and realizing I had the camera a few inches from my face and not wanting to drown out the audio. That however takes nothing from the fact that the guys looked great and my excitement for the weekend only grew. Saturday. There are not enough words in this crazy English language to describe what was Saturday. Rose Noire finished with an encore that had the crowd high and energized. They were eager, alive and hungry for more. As the intro audio kicked in and the hush of ‘Daizy…Stripper’ was played the crowd became alive and screams and chants were vocalized as the members set foot on stage. Kazami took to the stage first, engaging the crowd while pacing back and forth like a caged tiger. Satisfied with the response he took his place as Rei then fronted the stage. The screams grew louder as Rei goaded the crowd and encouraged them to grow in range to almost inaudible ranges. 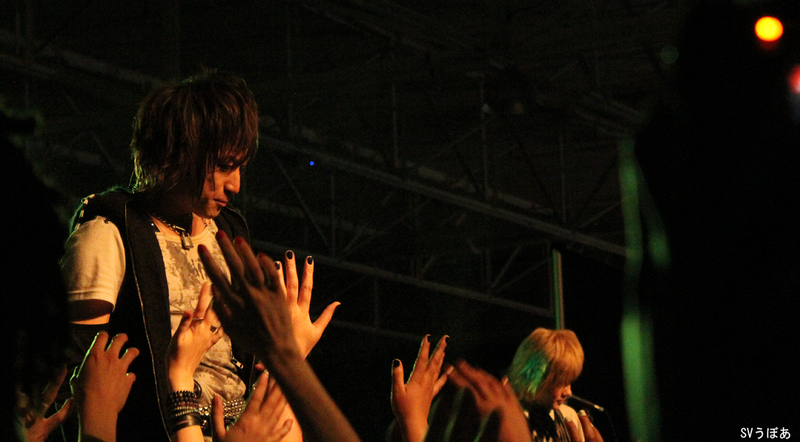 Nao then made his appearance, teasing and flirting with the crowd before Yugiri emerged. 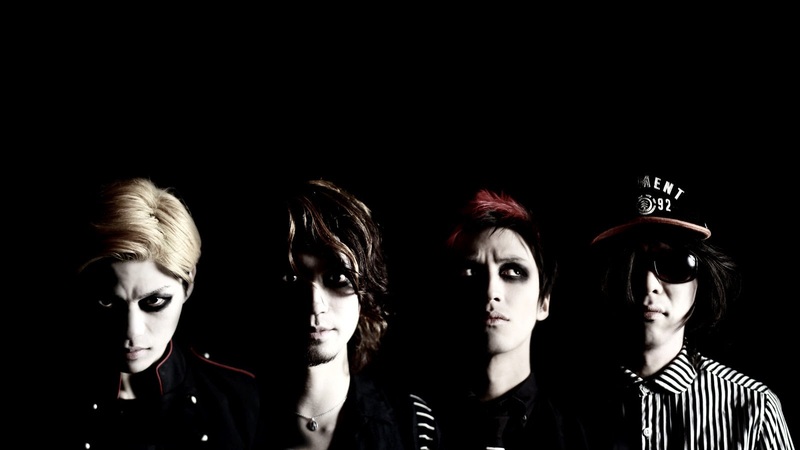 Yugiri then taking over where Kazami had left off, soaring chants ever higher before diving into one of their singles from the past year, Derringer. 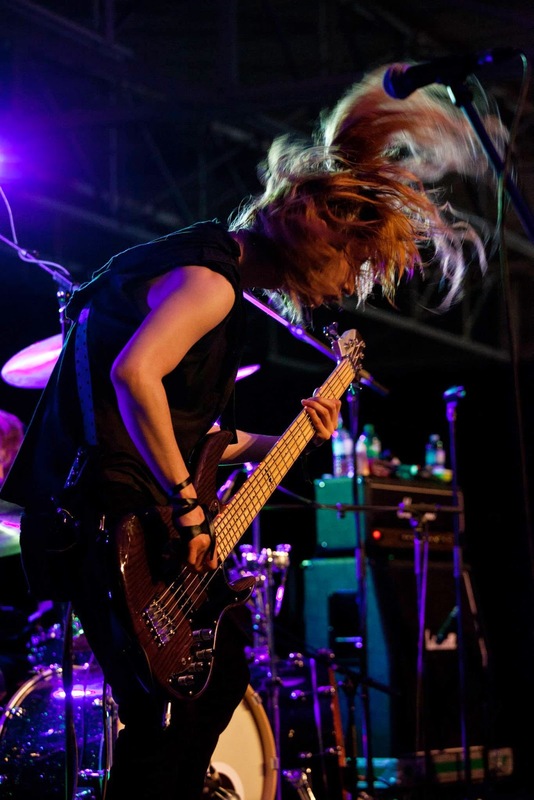 The energy continued through MISSING and uso to kagerou which was incredible live – though I partly wish I could have seen Rei play it on the vertical bass! The crowds energy only ever increasing, I have never heard such a consistent roar! At this point, though we were screaming for more, Yugiri gave his first MC. 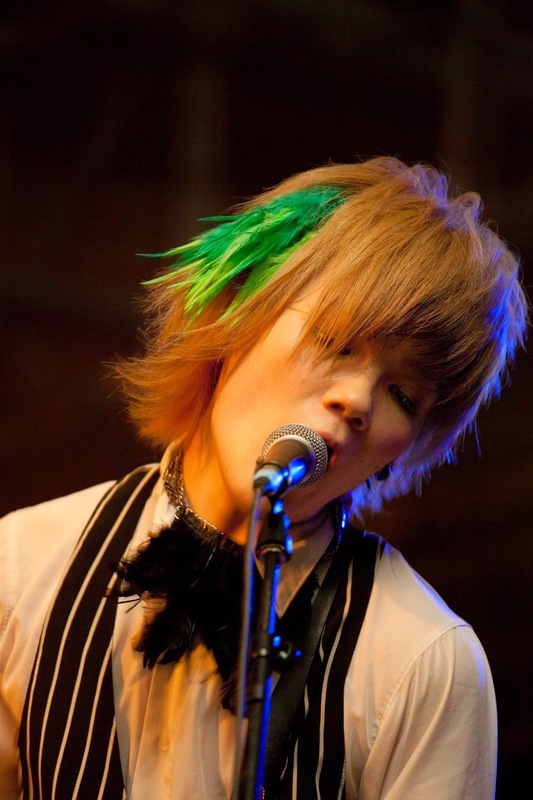 Though limited with his English, he spoke of the band, the music that is him; DaizyStripper is his everything. And given recent band changes, it only spoke that much more. After baring his heart to the crowd we were treated to their latest single G.Z.S.K.K. If you haven’t picked it up yet, you need to! We were driven into a frenzy as the band continued relentless through the height of the live. 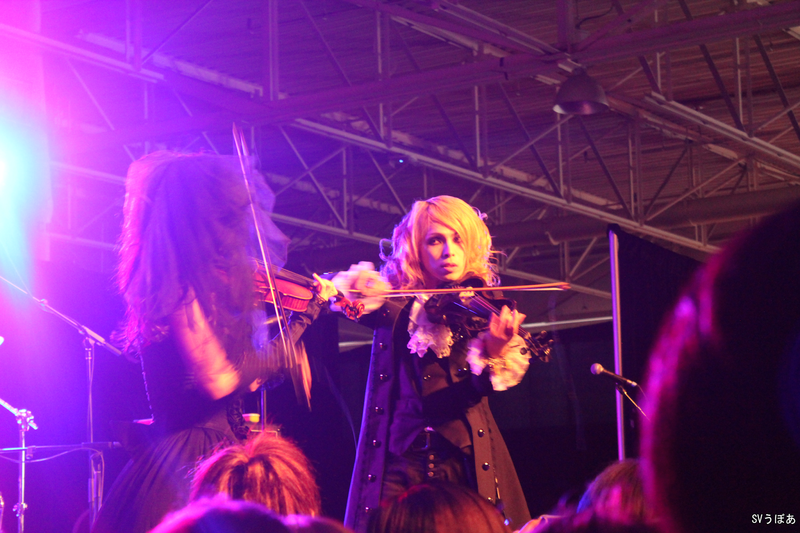 Yugiri ever engaging the crowd, while Rei constantly up front calling the fans towards them as we were crushed into the rhythm of the songs. The crowd was enthralled, unified in their surges and the head banging was non-stop. Nothing ruins a live more than a poor crowd, but the fans were fantastic. This was definitely one of my favorite crowds to be a part of. All too soon we reached the second MC, and Yugiri gave the crowd props, while telling us that they will be back, so long as there are fans. And that this is not good-bye, but “HELLO, again” completing their inclusion of the 5 singles released last year. As the song closed, the band was greeted with the cries of the fans yearning for more, all in agreeance that it was over far too soon. As they left the stage, we cheered, chanted and thundered our support and desire for ‘one more song’. A short interlude later and DaizyStripper took the stage once more, the crowd’s energy seemingly not depleted in the slightest, feeding the band ever higher. Though my memory has failed to provide me which track they played, the enjoyment I will never forget. The fans were electric, the band exhausted but glowing. 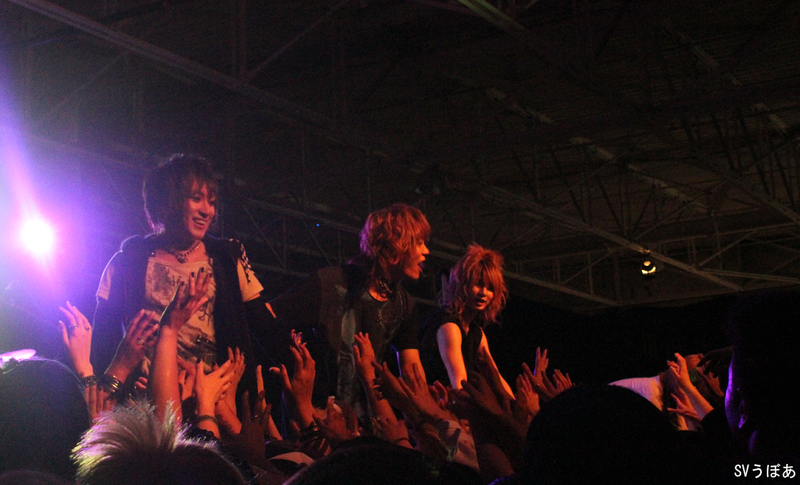 Yugiri took flight as he dove into the crowd, followed shortly by Kazami, both delivered safely back to the stage. After completing an autograph session right after their live Saturday night, some rest and warm sunshine brought us Sunday afternoon. The fan Q&A panel was held just after lunch, though the line to attend started well in advance. Not held in the usual conference room, we were sent into a room that sadly was not the ideal set up to allow all fans a good view of the bands at the table. That said, everyone did fit inside the room, and all had an opportunity to ask the band their question. As the convention had only allotted an hour for the Q&A, the autograph session following was held in a communal area of the hotel. Thankfully time allowed all fans who wanted to get their merchandise signed by the bands the ability to do so. 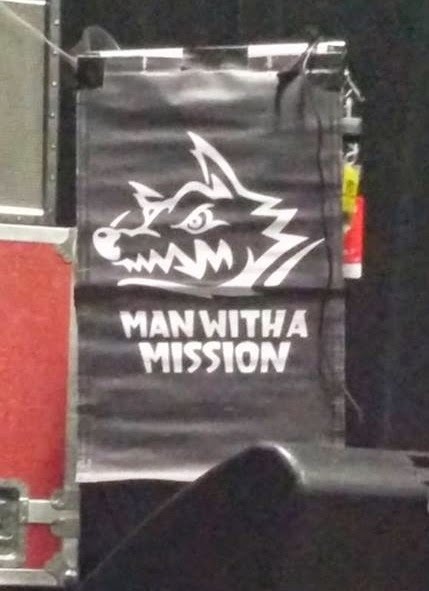 At the end of the session, a banner prepared by some fans was presented to the band. Filled with sentiment and wishes, and certain to convey our desire to see them live here again! I know I and many others look forward to their return to Canada! 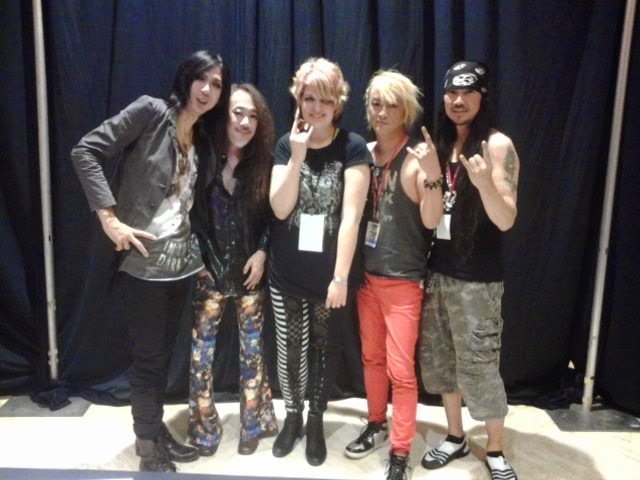 Thank you to J-rock North Promotions, Beyond-MAX and of course DaizyStripper for a fantastic weekend! —Freddy Lim, May 1, 2014. The Opera House, Toronto. Following their striking instrumental introduction Arising Armament, Taiwanese metal icons Freddy Lim, Jesse Liu, Dani Wang and the stunning Doris Yeh, launched into their first concert in Toronto since 2011 with Supreme Pain for the Tyrant, a powerful song boiling out of the rage and memories of Taiwan’s war torn history. From the 2013 album Bú-Tik, the war cry “Let me stand up like a Taiwanese! Only justice will bring you peace!” infected even non-Taiwanese fans. Almost the entire set list was from the Bú-Tik album, with the exceptions of classics Oceanquake and Takao, both from their previous effort Takasago Army (2011). With five bands at PaganFest it was an unfortunately short set, 40-odd minutes, but highlights like Sail Into the Sunset’s Fire and Defenders of Bú-Tik Palace made it worthwhile. The show was fantastic, and demonstrated the adaptability of the act. Deprived their keyboard player CJ Kao, Chthonic’s response was to give the audience a stripped-down version of the band, proving the virtuosity of these sophisticated musicians. The result was raw power, interrupted occasionally by Lim’s haunting erhu and Doris’ evocative vocals. Worth noting was a heart-rending version of Defenders of Bú-Tik Palace, the band seeming to reach the peak levels of performance. After the concert Freddy, Doris and Jesse seemed relaxed and in high spirits. The band was incredibly forthcoming with fans, taking the time for pictures and questions…a refreshing way to cap a refreshing if not incendiary evening. CJ Kao – keyboards (absent for personal reasons).